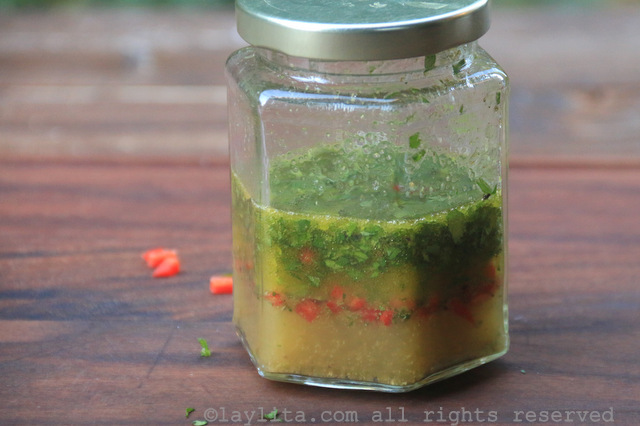 This spicy orange vinaigrette recipe is made with orange juice, lime juice, vinegar, olive oil, cumin, cilantro, and red chili pepper. This orange dressing is perfect for salads that have fruit (mango, orange, apple, avocado) and also for salads with shrimp or chicken. I used a red Fresno chili pepper, but you can use any hot pepper that you like. 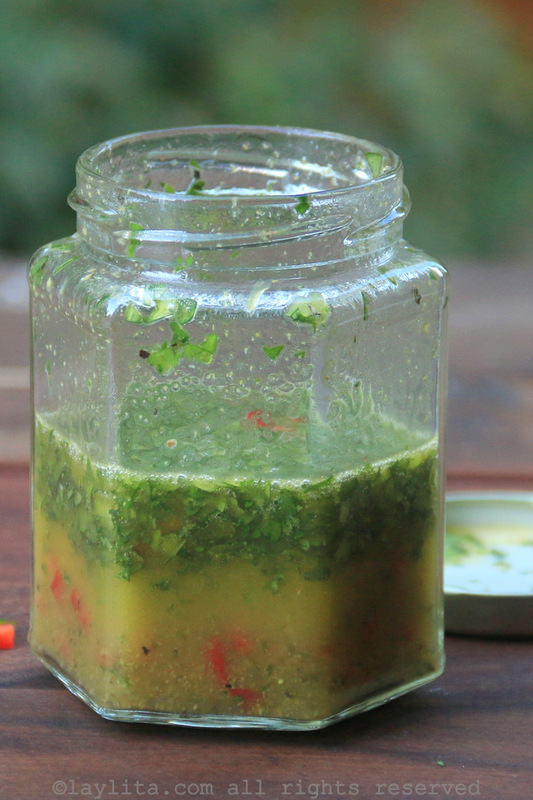 I love using cilantro in salad dressings, but if you prefer something different you can use parsley, basil, etc. 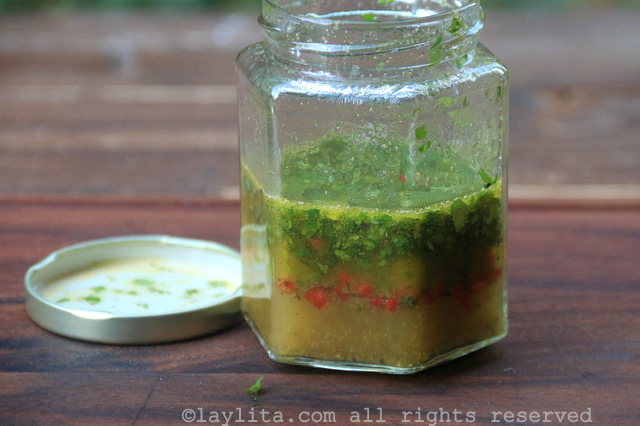 My favorite way to make a vinaigrette is to place all the ingredients in a jar (that has a lid that closes tightly), close the jar, and shake the jar until all the ingredients are mixed. You can make this spicy orange vinaigrette ahead of time and keep it refrigerated until ready to use, just give it another shake right before adding it to your salad. 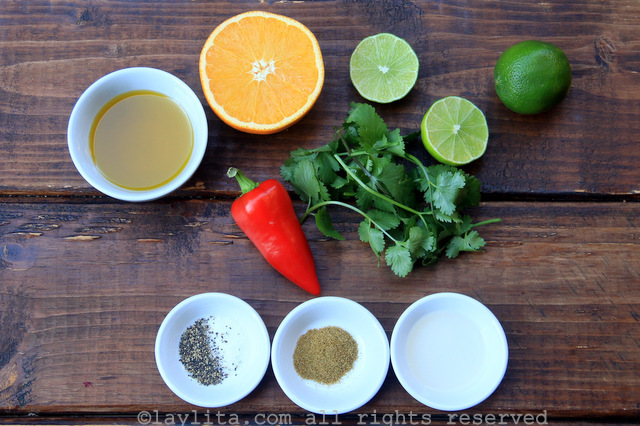 Easy recipe for a homemade spicy orange vinaigrette recipe made with orange juice, lime juice, vinegar, olive oil, cumin, cilantro, and red chili pepper. Place all the ingredients for the vinaigrette in a jar (that has a lid), put the lid on the jar, and shake until the ingredients are well mixed. The orange vinaigrette or dressing can be used immediately or refrigerated until ready to use - simply re-shake before using it. 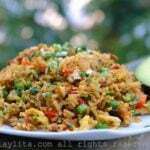 Great ingredients in your vinaigrette,thanks fo the recipe Layla.